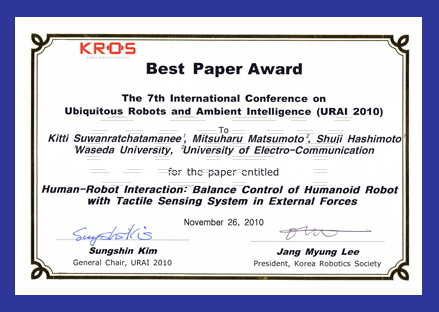 "Received the Best Paper Award"
Paper title: "Human-Robot Interaction : Balance Control of Humanoid Robot with Tactile Sensing System in External Forces"
The 7th International Conference on Ubiquitous Robots and Ambient Intelligence (URAI-2010), BEXCO, Busan, Korea, November 24-27, 2010. 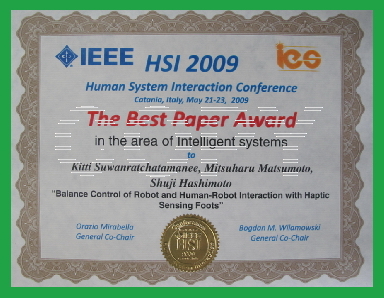 "Received the Best Poster Award (Gold-Prize)"
Poster title: "A Research Regarding Development and Application of Tactile Sensing for Robots"
"Received the Best Paper Award (Intelligent System Area)"
The 2nd IEEE International Conference on Human System Interaction (HSI-2009), Catania, Italy, May 21-23, 2009. 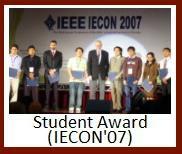 Project title: "Development of the CNC Wing Foam Cutting Machine"
The 3rd Annual university project contest 2002, March 28, 2002. 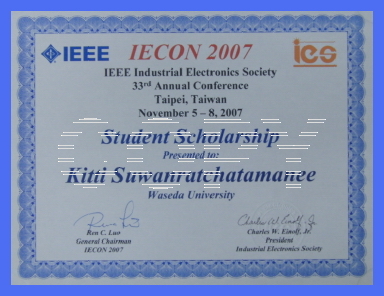 The 33rd Annual International Conference of the IEEE Industrial Electronics Society 2007-(IECON-2007),Taipei, Taiwan, November 5-8, 2007. 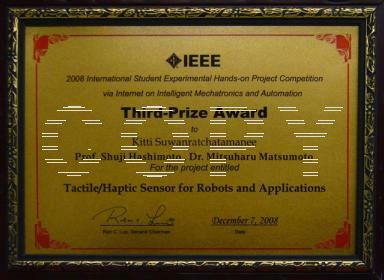 Project title: "Tactile/Haptic Sensor for Robots and Applications"
Internet conference/competition, December 6, 2008. 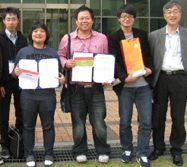 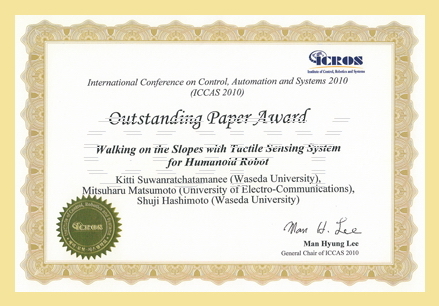 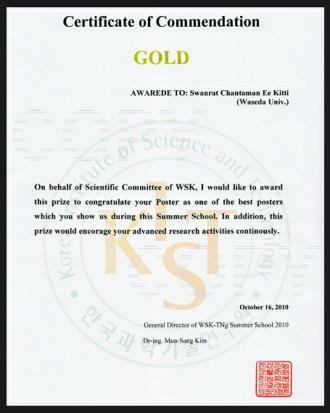 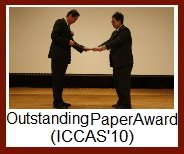 "Received the Outstanding Paper Award"
Paper title: "Walking on the Slopes with Tactile Sensing System for Humanoid Robot"
The 8th International Conference on Control, Automation and Systems (ICCAS-2010), KINTEX, Gyeonggi-do, Korea, October 27-30, 2010.